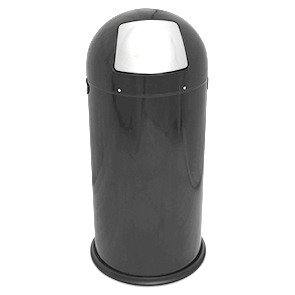 The 14 gallon steel trash can features a stainless steel self-closing push door lid, round body with molded recessed hand grips and base ring. The dome top lid tightly attaches to the base, keeping contents out of sight and odors contained. Inside the trash receptacle is a standard galvanized steel liner easily accessed for servicing by the lift-off dome top lid. With all-steel construction that is finished with a durable and scratch resistant powder-coating, these trash cans are built ready for high volume use. A universally popular choice for preserving well-kept appeal in public lobbies, restrooms and waiting areas.